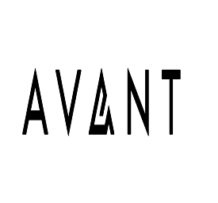 AvantCredit has rebranded its company name to Avant. Avant provides access to personal loans in most states across the U.S.
No ahead of time repayment fees. Avant (formerly AvantCredit) is a personal loan provider and a popular online lending platform based in Chicago, established in 2012. The company provides access to personal loans without requiring any collateral. Avant currently operates and offers lending services to the citizens of United States and also provides similar service in Canada and United Kingdom. Avant has grown rapidly; the startup has moved quickly to the top slots in the lending industry since its 2012 launch. They have provided access to personal loans through their online platform to more than 350,000 customers and counting. The company currently holds an A+ rating with the Better Business Bureau and is accredited by the organization. Avant offers access to financing even to the borrowers who have less than perfect credit scores; the loan amount ranges between $2000 to $35000*. The minimum and the maximum amount an individual can borrow vary from one state to another. The funds can be utilized for debt consolidation, paying pending bills, wedding event, home improvement or repairs, medical expenses, vacation, there are no restrictions on how the funds are used. All Avant branded credit products are issued by WebBank, a Utah-chartered industrial bank, member FDIC. Must have a stable income & employment information. Must have an active bank account, which accepts ACH transfers. Must have a valid driver’s license or any government issued ID. Must have a valid and working phone number. Must have a valid social security number. To qualify for a personal loan with traditional banks is usually difficult, due to the credit requirements unless the borrower has excellent credit scores. Approximately 50% of U.S citizens have credit scores under 680, and a majority of traditional banks will not approve you for a financing in case your score is below 680. Avant is much more focused on the middle-class borrowers. 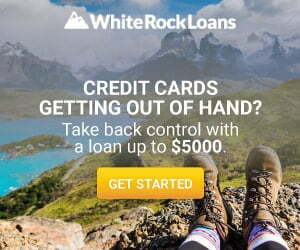 The credit requirements are far more lenient in comparison to traditional lenders; the minimum credit score accepted to qualify for a personal loan is 580 or above. Credit scores aren’t the sole factor; that is taken into consideration to be eligible for a loan. There are several factors, which are considered while making a decision to approve an application for the loan. The credit score certainly is the primary factor. Besides credit scores, other factors such as your income, debt to income ratio, the length of credit history, employment history, etc. will be considered. The creditworthiness of the borrower is what determines whether the application should be approved or declined. Avant has no physical branches; the application process is carried out entirely online. You can apply for a personal loan using a secure and encrypted online form by visiting Avant’s website. The site interface is user-friendly and fully compatible with computers and smartphones. Additionally, you can install Avant’s mobile app which is available for both iOS and Android. The app enables you to check your rate, complete your loan application, manage payment schedule and make additional payments. The online application process is safe, straightforward and uncomplicated and can be finished in a couple of minutes with few steps. The first step to begin the application process is by checking how much you qualify for and whether you are eligible for a loan. Avant’s “Check Your Loan Options” feature allows you to find out, the loan rate and term you are entitled to without affecting your credit score with a soft credit inquiry. To check your loan options, you’ll need to fill out a form with your full name, address, email, phone number, state, date of birth, social security number, income details and create a password. On submitting the information, an account with Avant is created, and you would receive a quote with different financing options along with the amount you are eligible to borrow if you qualify. Qualifying for a loan does not mean approval, additional verification and supporting documentation may be required before the loan application can be approved. The second step is to review different financing options displayed in the quote with varying loan terms, interest rates and monthly payments. If you find an offer that matches your requirements and the one you can afford, select the loan offer and proceed with the application process. Once you decide to move forward, Avant will initiate an identity verification process via electronic knowledge-based authentication (KBA). In which you will be asked few tough questions that only you can answer. Avant may even ask you to verify your employment, income and banking information with supporting documents to authenticate the details and will also conduct a hard check on your credit during the underwriting process. The third step is to finalize your loan, on completing the application and after verifying required information, the status of your loan will be displayed on the account dashboard. If approved, the final terms of your financing will be disclosed which would include the rate of interest, the total number of payments, monthly payment, and total loan cost. If you agree to the terms, you will be directed to sign an online agreement electronically to complete the process, and the funds are directly transferred to your bank account by following business day. The actual time for the funds to become available depends on your banking institution. The annual percentage rate (APR) ranges anywhere from 9.95% to 35.99%. The rates that you may qualify for is calculated by assessing your credit history, loan term, the state of residence, and income. The repayment term of the loan varies from 24 months to 60 months with fixed monthly payments. Avant also charges an upfront administrative fee up to 4.75%, which is non-refundable and is only charged if the loan is issued. Additionally, the fee will be automatically deducted from the amount financed when the loan is funded. For example – A $5,700 loan with an administration fee of 4.75% and an amount financed of $5,429.25, repayable in 36 monthly installments, would have an APR of 29.95% and monthly payments of $230.33. Avant may also charge a $25 late fee for missed payment, and a $15 returned check/NSF fee for failed payments. Disclaimer: * The actual loan amount, term, and APR amount of loan that a customer qualifies for may vary based on credit determination and state law. Minimum loan amounts vary by state. Benefits of Borrowing Through Avant. 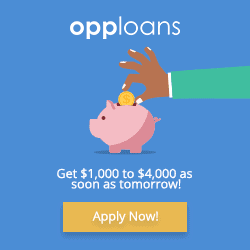 No prepayment fees: – There are no prepayment penalties or fees for making extra payments or if you desire to close the loan early by paying off the balance. 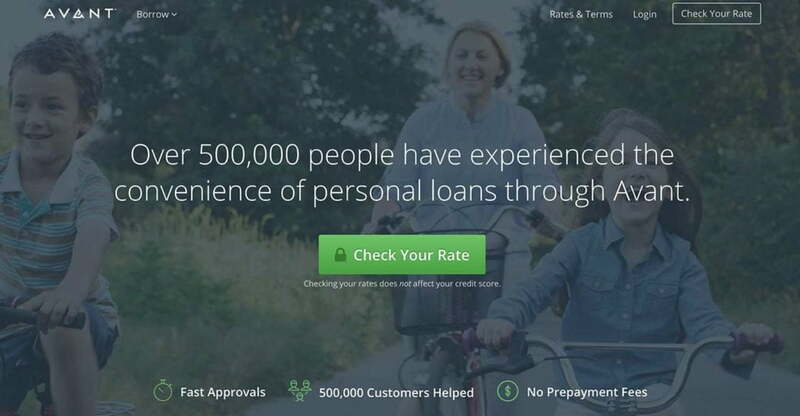 Build Credit: – Avant reports your loan payments to all three credit reporting agencies. This may help you to build a better credit rating if you make on-time payments towards your loan. Avant has always focused on providing exceptional customer support to their clients and has been consistently rated high on their highly responsive customer service. The support team can be contacted seven days a week via phone, email, and chat. Funding Time As soon as next business day ‡. Monday - Friday, if approved by 4.30 PM CT.